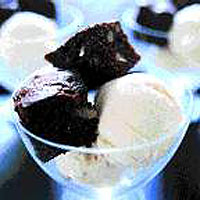 Delicious and easy to make, serve with Waitrose Ice Creams - my favourites are Organic Vanilla and Organic Chocolate. Preheat the oven to 180°C, gas mark 4. Butter and line a 20cm square tin. Melt 150g of chocolate in a bowl set over a pan of simmering water. Add the butter and stir until melted and blended. Cool slightly. Chop remaining chocolate and reserve. Beat the eggs with the sugar and vanilla until pale and creamy, then fold in the flour, baking powder, salt, pecan nuts and the reserved chocolate. Stir into the melted chocolate and pour into the tin. Bake for 25 minutes until set. Cool in the tin, then cut into 16 squares. Serve with scoops of ice cream.